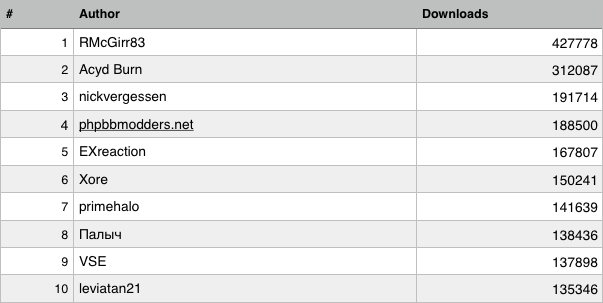 To round out this series, we’ll look at the different categories of extensions that people like to download. 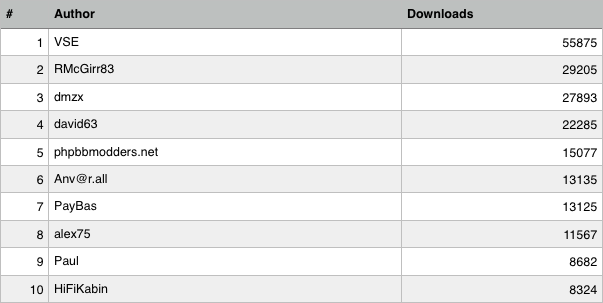 It’s worth mentioning that the download figures will not add up to the total extension downloads from part four, because some extensions belong to more than one category. 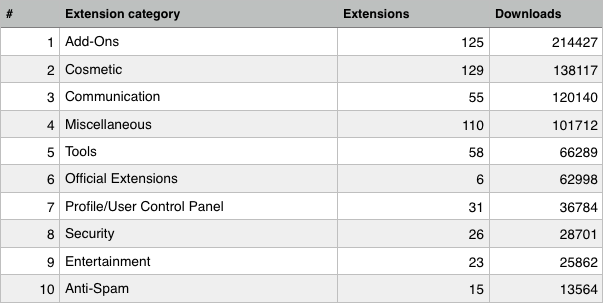 Add-Ons are the most popular type of extension, most likely due to their broad nature, with all of the top 10 most downloaded extensions belonging to this category (among others). Official Extensions get downloaded in huge numbers due to their high profile, while some of the most downloaded extensions like Board Announcements and Advanced BBCode Box 3.1 belong to the Communication category. Interestingly Anti-Spam extensions don’t feature highly, but with that said it’s probably a good thing if additional measures are not required to keep the spambots at bay. This brings to a conclusion the phpBB Numerology series. I hope those that appreciate their statistics – or have a general interest in phpBB and its user submitted customisations – have enjoyed these last five blog posts. The third part of this series has a look the most popular language packs. The most interesting observation, bar an anomaly with Brazilian Portuguese, is that the number of downloads corresponds quite closely with the number of total pageviews. This implies that when people download language packs, they know in advance what they want and there is little hesitation in following through to actually download it. 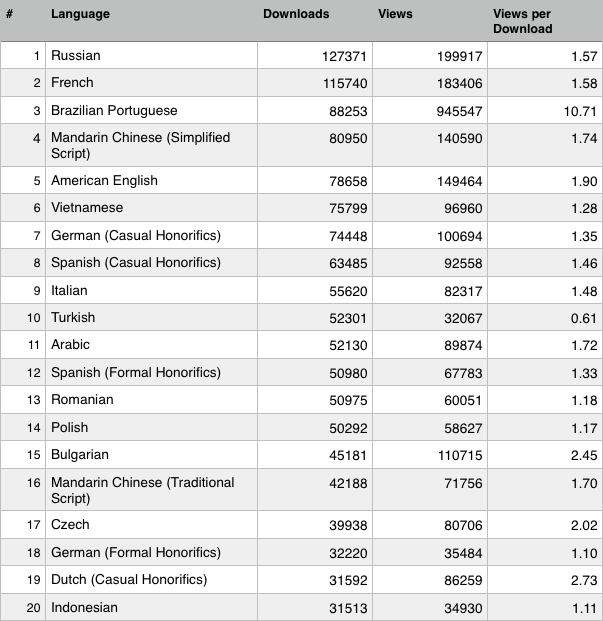 The average views per download for language packs is 2.29. By comparison, for phpBB 3.1 extensions that figure is a little higher at 3.53 – which suggests perhaps people casually browse more for extensions than language packs – which makes sense given for region specific forums a language pack is a necessity. That European languages dominate the top positions in the list is not surprising either. It is evident from the make up of phpBB.com’s own community that phpBB is very popular in Europe. In part four of phpBB Numerology, we’ll look at some of the lesser known customisations. For the second blog post in this series I thought it would be interesting to do a direct comparison with the data presented in the 2011 post. There are a few figures which are unrealistic, which have been struck out accordingly. For example, “User recent activity” apparently has nearly 80,000 downloads while its customisation page has only had 5300 page views. 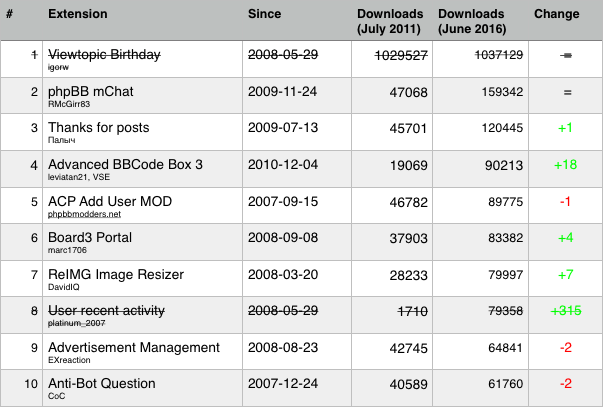 The most significant movers and shakers were the Advanced BBCode Box 3 MOD, which had a huge spike in downloads in moved up 18 positions from 2011. The ReIMG Image Resizer also experienced a spike, but due to its favourable position in 2011 only moved up 7 places. None of the top 10 from 2011 experienced large drops. 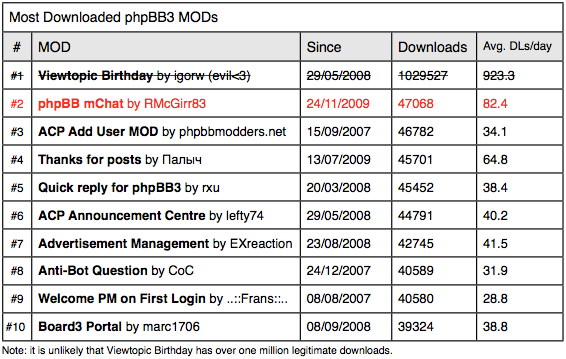 Due to the overwhelming successes of the Attachment MOD and Cash MOD for phpBB2, both Acyd Burn and Xore remain among the most downloaded phpBB MOD/extension authors of all time. 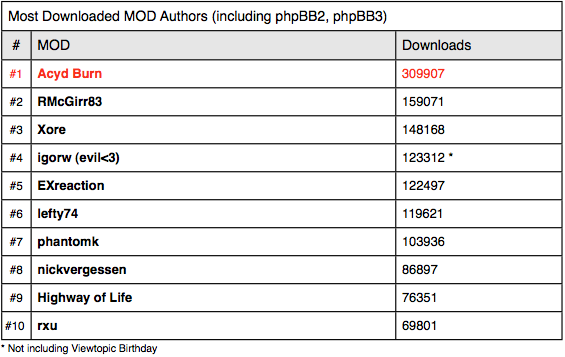 nickvergessen is the third most downloaded author of all time, despite not having any entries in the top 10 downloads for an individual customisation. This is because two of his submissions are/were highly popular and fall just outside the top 10 of their respective lists; phpBB Gallery for 3.1.x has 57,070 downloads while NV advanced last topic titles for 3.0.x has 49,372 downloads. In part three of this series, we’ll look at the most downloaded language packs for phpBB which will also offer some insights into which regions phpBB is most popular. Five years have now passed since our first statistical journey through the archives of the customisations database (see MOD Statistics: The most downloaded MODs from the MOD Database). Armed with just one table from our database, I’m setting myself the challenge of creating five blog posts worth of in-depth (and hopefully interesting) statistical data about the way users download extensions from phpBB.com. The obvious starting point is to revisit the original blog post, and see what the state of play is in 2016. 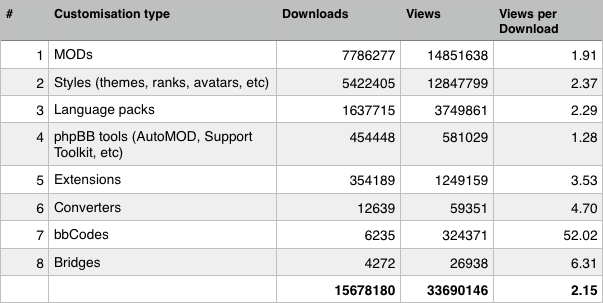 Then, we looked at the most downloaded MOD authors and well as the most downloaded MODs of 2011 and of all time. We’ll repeat that exercise with extensions now. Starting with the most downloaded extensions overall, we can see it’s a tight race for first place between Board Announcements, Advanced BBCode Box and Pages. 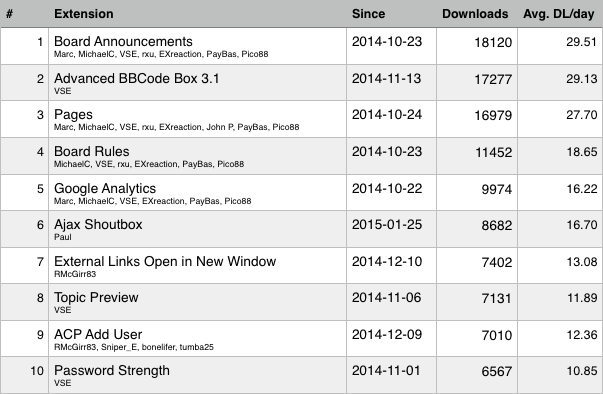 Little over a thousand downloads separate the three extensions which average close to 30 downloads a day. Just after the half way point of 2016, Application Form and Scroll Page are favourites of the phpBB community with close to a thousand downloads each. While dmzx has submitted more extensions than any other author with 43 extensions, it’s VSE who has been associated with the most downloads by far – 55875 in total. Stay tuned for part two of Numerology in next weeks blog post, where we’ll take a stroll down memory lane and look at the movers and shakers of phpBB 3.0.x between 2011 and 2016. Most of you have probably already seen the blog post regarding the RFC process for hook locations to be added to Ascraeus (phpBB 3.1). And many of you may not know what a hook system actually is, so I will take the time to explain it. In Olympus (phpBB 3.0) all new additions to the core must be made by editing or patching the core files. The MODification is either installed manually or by using AutoMOD. What a MOD usually does is add some specific code at a specific location, this ranges from database queries, template assignments and loading of language files to any custom PHP code. Now, this approach worked for 2.0 and it works for 3.0, but frankly it produces a horrible mess. Installing MODifications is a great pain, uninstalling them is almost impossible in many cases. To solve this issue we are introducing a hook system. The hook system defines code injection points, giving each one of them a unique identifier. The hooks controller allows MODifications to bind to a specific code injection point or hook location. When that point is reached in execution, the hooks controller will call all of the hooks that registered, passing in the context, so that local variables can be read and/or modified by the hook, thus “injecting” the hook into that location. Technical details can be found within the General Hook Architecture RFC. To remove the need for any core edits the files defining and registering hooks will be automatically loaded. They will be in a certain folder that phpBB will scan regularly. This will hopefully make the whole MOD installation procedure automagic. You drop in the files and are ready to go. To make the registering of hooks more convenient, MOD authors will be able to define a class of which each method represents a hook. This allows all hooks belonging to a certain MOD to be grouped within one file that can be automatically loaded and registered. Here is an example with code. Note that this API may change since it’s not final yet. The hook location will be in user_add as described in this RFC topic ([RFC] user_add hook). We will create a file called hook/logging.php (convention will change) containing the following class, which will be loaded automatically by phpBB. Since we want to hook into user_add and the RFC describes the input arguments as $sql_ary, $cp_data (by reference), our hook will have to take those arguments. In this example we will write the unix timestamp and the username of every new user into a log file. This happens right before a user is created. The user_add() function will execute all ‘user_add’ hooks before inserting the user. While we are only reading the arguments here, it is also possible for hooks to modify them. So, how does this work? Let’s take a look at the engines that power this. These are mostly internals of the hook system that you will not have to deal with, because it is all taken care of by phpBB. Before we can do anything hook related, we need to create a hooks controller. The hooks controller manages the hooks and makes sure all of them are called. All hook-related actions go through this class. In phpBB this controller is automatically loaded, and there is also code that will load all the hook files (hook/*.php). It registers the hook containers of those files with the hooks controller. This calls all hooks that bound to ‘user_add’, passing the two arguments into them. There will be quite a few of these hook locations to take advantage of, and they will always provide a context that you can work with. As a MODification author you will also be able to provide your own hook locations to other MOD writers. All it takes is a call to invoke_hook, which will allow others to hook into your code. There are some more advanced features about hooks, such as (un)installing, enabling/disabling, prioritising hooks. But I’ll save that for later. So now that you understand the basics regarding hooks, I hope you can look forward to this great addition in ascraeus and help us by contributing Hook Location Requests.